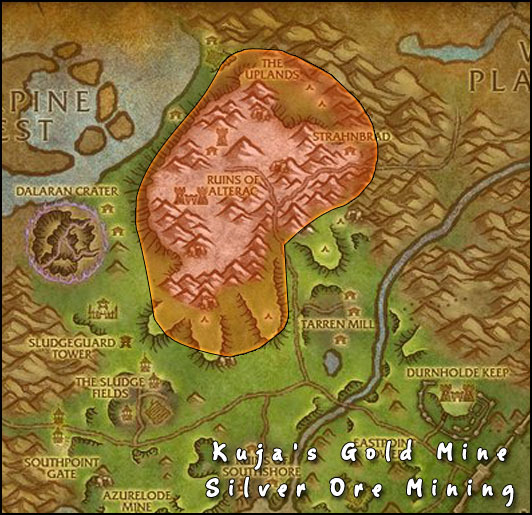 Silver Ore is often the most expensive ore in the game, even though a Silver Vein requires only 65 skill before it can be mined. This makes it a great supply of gold for a low level player with the profession! Alterac Mountains offer lots of Silver Veins. Silver Veins are sometimes spawned instead of a Tin Vein. So in order to farm Silver Ore efficiently, one has to mine the Tin Veins aswell and hope they respawn as Silver instead. While Tin ore is worthless usually, a Tin Vein can contain precious gemstones. Some of these sell for a lot of gold, and if you have jewelcrafting too, you can prospect the ore and turn them into low level jewelry which often gives a nice profit. Pricing is tricky. It's so rare there is never enough of it in the auction house. It's price often varies between 2-25 gold per Silver Ore. This makes it hard for new miners to know the proper price. Some people monopolize it by purchasing all of them and relisting for closer to 50-80 gold per ore. While Silver can be smelted into bars, ore is more expensive because it's needed by aspiring miners. It provides fast skill ups in the tin-iron phase when smelting it. There are many zones where tin spawns, but after some research Alterac Mountains in Hillsbrad Foothills would be the best choice. It's a small area with lots of cliffs and caves. That means lots of mineral nodes! Lots of Silver and Tin ore can be found in the Ogre caves!